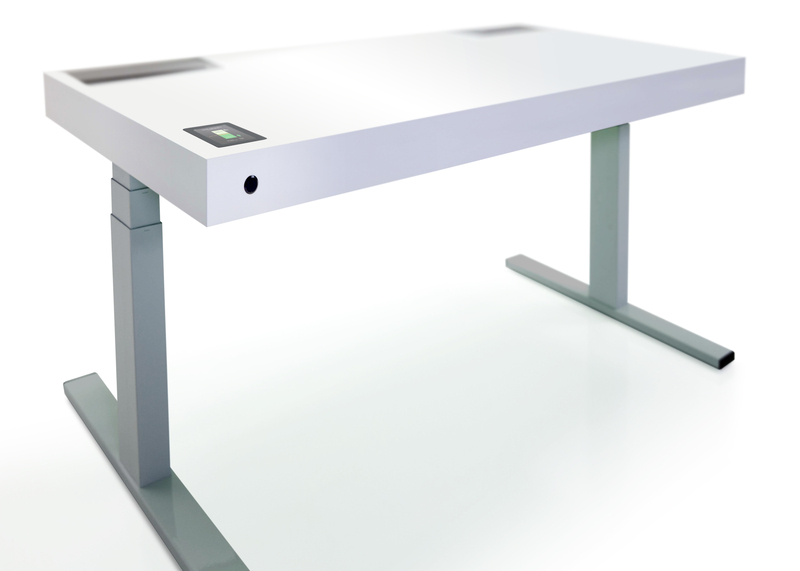 Stir, a company based in Pasadena, Calif., has created a connected, height adjustable desk that it bills as part of the quantified self movement. Founder and CEO JP Labrosse was very clear about his hope that people would accept this in the same category as their Jawbone Up bands or their Zeo sleep monitors. But in looking at the beautiful, $4,000 (okay $3,890) piece of furniture all I saw was this generation of startups’ Aeron chair — that ubiquitous piece of office furniture in startups from the late 90s and early aughts. The chair was ergonomic, but at about $900 it was just pricey enough that you wanted your first round of funding before you splurged. The potential health and productivity benefits for your valued employees was worth the cost. And like that chair, the Stir Kinetic Desk has a similar proposition, only updated for this decade’s health concerns and outfitted with today’s technology. The concern is sitting. As I type this standing at my own height adjustable desk (unconnected, $1,100 with tax and delivery), I’m currently proof of the ubiquity of this concern. And I’m clearly not the only one. Employers are shelling out for sit/stand desks for employees as articles come out trumpeting the dangers of sitting. Labrosse even gave me the welcome news that if I stood for four hours a day I’d burn an estimated 4,000 more calories per month. So, let’s talk about the desk itself. It’s a really attractive piece of furniture. Labrosse was a former product designer at Apple. My desk (pictured below) doesn’t have shielding between the lift mechanism in the legs and the cord management is two circles on top. To raise or lower the desk, I have to hold down one button while I toggle another up or down. There are no pre-set settings. The Kinetic desk makes mine look like cinderblocks and plywood on hydraulics. 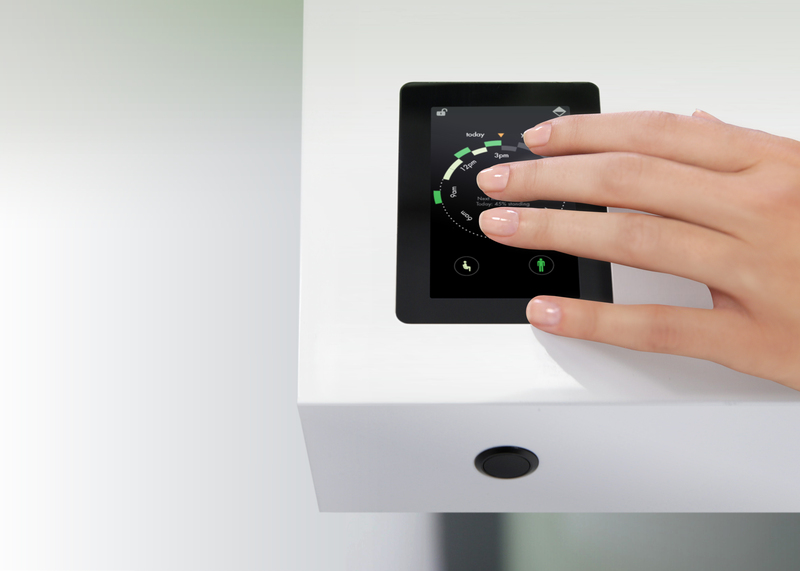 It has a capacitive touch screen in the lower left hand corner that controls the lift mechanism and moves it to one of several pre-set locations. That same screen shows you how long you’ve been standing or sitting, while a thermal sensor underneath the desk tracks how long you are actually at your desk. There are charts and data to track your sitting and standing. The screen is set in a thick piece of white varnished wood (it also comes in black) that contains an inset cord management system on each back corner of the desk. It has eight plugs and USB ports powered by one cord dangling down from the desk. Finally, you can order the desk with one of several shades that color the underside, inside the cord management inset and the desk’s single power cord. Labrosse says the desk has a learning algorithm (like the Nest!) that can remind you when you generally like to stand. If you put it in automatic mode it will move for you. If you put it active mode, where you control and then get really focused and stop moving, it will gently move up and down (“like a breath” says Labrosse) to remind you to take a break or to move the desk. Labrosse also wants to connect people’s activity tracking devices eventually so if you go for a long run in the morning, the desk might change its prompts to give you a chance to recover. It would be awesome to connect this desk via If This Then That so the desk could act as a trigger. Like when the thermal sensors sense you’ve left, it turns your IM status to away. Or perhaps the desk could move up or down in response to an email form your boss. I asked Labrosse if he might put a few LEDs inside the desk to give it more ambient information delivery capabilities, and he was just as excited as I was to talk about what you might want your desk to tell you versus a phone or another connected device. Labrosse’s pitch was very much like a mattress salesman’s … you spend a third of your life at your desk, shouldn’t it be good for you and beautiful. And yet, for now, this is a desk for the 1 percent. It’s beautiful, pushes us closer to this idea of everything being connected, but it does it in an incredibly expensive way, with hand-crafted wood tops made in Brooklyn and a value add that will appeal only to the upper echelon of techies. And those who want it must wait until the first quarter of next year for delivery. I can see executives and maybe engineers at companies with fat profit margins or VC funding, working at these, but it’s hard to envision someone like myself picking one up, even if I wanted to. But if I did pick up such a desk, I know exactly the chair I’d want to go with it. Is that a Geekdesk in your picture? It sure looks like one. The Geekdesk is great. Yes, it is a bit clunky compared to Stir’s version, but it’s about 1/5 of the price. It is too thick. The work surface should be 2cm, not the bulky ~10cm it appears to be here. 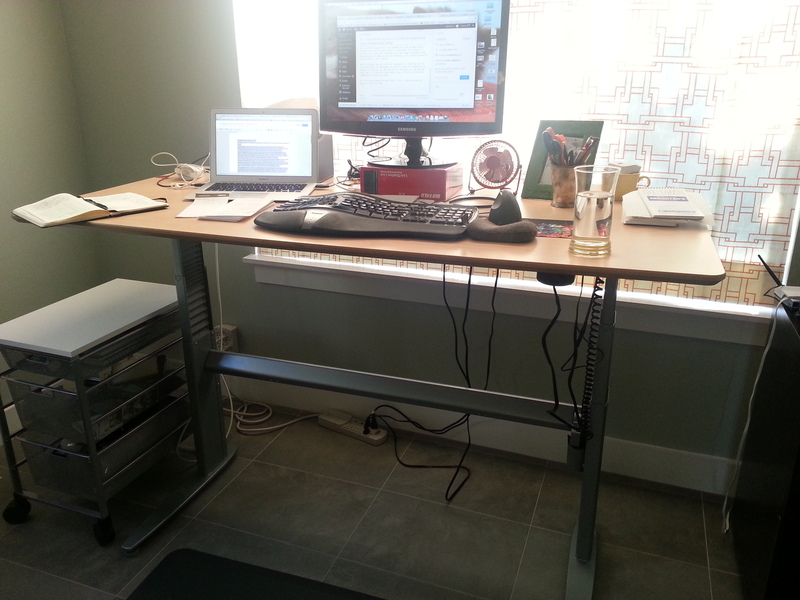 For a standing desk that is ok, but if it is intended to be a sit-stand desk, it becomes incredibly uncomfortable when sitting. There is no “thigh space”. You cannot adjust your legs under the desk at all. It is like making a desk out of a kitchen table. Have you ever sat at a kitchen table with your laptop and tried to adjust your sitting to get more comfortable, only to realize there are limited sitting options at a table that was meant to be used for less than an hour at a time? As for the author’s desk…. you should’ve only purchased the frame from geekdesk. Geekdesk has two grommet holes drilled on either side. Who runs cables like that? You would have been better off getting the IKEA Gallant table top ($80), and its associated cable management tray (~$15) to place on the geekdesk frame. I hear ya on the desks’ thickness, but there’s no call to criticize my cord management. I can’t let those dangle through the holes in the desk or they get too short when it’s raised to its full height.